On August 6, 1945, the United States dropped the first nuclear weapon used in war on the Japanese city of Hiroshima, immediately killing an estimated 80,000 people. The death toll may have risen to 200,000, with many more injured, displaced and suffering the effects of radiation.2 On August 9, the U.S. used a second weapon to bomb Nagasaki. On August 15, the Japanese Empire surrendered, ending World War II. After the nuclear arms race of the Cold War, and post-Cold War challenges of nuclear proliferation, the bombings of Hiroshima and Nagasaki remain controversial as the only two cases of nuclear weapons used in conflict. More than seven decades after Hiroshima’s destruction, Barack Obama became the first sitting U.S. president to visit the city’s war memorial on May 27, 2016. The visit was not without controversy, however. This issue brief addresses three related questions: what motivated objections to a presidential visit to Hiroshima, why did President Obama ultimately decide to go, and what are the implications? Different sets of objections in South Korea and China illustrate the trajectory of regional politics in East Asia, while the abatement of political opposition in the U.S. and Japan offered auspicious timing for a reconciliation event. The powerful symbolism at Hiroshima will help advance global nonproliferation efforts, but Obama’s nuclear legacy is most seriously challenged by North Korea’s nuclear weapons development. President Obama delivers remarks with Prime Minister Abe at the Hiroshima Peace Memorial Park, May 27, 2016. Kimimasa Mayama ⓒ REUTERS. Policymakers in Beijing appear intent on painting China on the right side of history: as a victim of imperialism but a victor in World War II. This narrative draws a straight line between wartime and present-day Japan, portraying Tokyo as untrustworthy and prone to aggression.9 Chinese media often apply this historical lens to Abe’s policies of strengthening Japan’s defense posture, increasing military expenditures, and reinterpreting Article 9 of the pacifist constitution to allow for collective self-defense. Beijing appears to play the history card against Tokyo for instrumental purposes.10 The official Chinese version of history, including anti-Japanese nationalism, is used for domestic consumption in service of the legitimacy of the Chinese Communist Party. Beijing looks to counter so-called “China threat theories,” (including accusations that China is challenging the existing international order), by diverting attention to Japan’s historical atrocities and incomplete reconciliation with its neighbors. Beijing also attempts to employ history to build regional pressure and extract concessions from Tokyo. Whereas Chinese objections to Obama’s potential visit to Hiroshima appeared motivated by state interests, South Korean objections focused on timing and process, and were largely driven by civil society. Despite broad agreement that a “reconciliation event” can be an important political gesture for international cooperation, healing wartime wounds, and setting a cooperative tone for future generations, South Korean observers tended to see Obama’s potential visit to Hiroshima as premature. First, some objected to Obama’s visiting Hiroshima during Abe’s leadership, because Abe is associated with historical revisionists who called for a review of the 1993 Kono Statement apologizing to “comfort women,” and who advocate patriotic education in the revision of history textbooks.11 Second, in light of how a Japanese prime minister has not yet visited Pearl Harbor (despite Prime Minister Yoshihiko Noda “being in the neighborhood” for APEC in 2011), many Koreans consider a presidential visit to Hiroshima as a case of the U.S. being “too generous” to Japan.12 Most importantly, the general sentiment in South Korea is that Japan should apologize fully for its wartime misdeeds in Asia before being on the receiving end of historical forgiveness. UN Secretary General Ban Ki-moon paid his respects at the cenotaph dedicated to Korean victims of the atomic bombing during his visit to the Hiroshima Peace Memorial Park in August 2010.17 Even though a South Korean president has yet to make such a visit, current and former government officials in Seoul met with their American counterparts to suggest that Obama walk from the main monument in the park to the one dedicated to Koreans. Some South Korean survivors and related NGOs promised to travel to Hiroshima during Obama’s visit to demand recognition, a more thorough historical accounting, and even compensation and written apologies from the Japanese and U.S. governments.18 These demands were not met by Tokyo and Washington, and despite the various objections by Americans, Chinese and Koreans outlined above, Obama made an unprecedented presidential visit to Hiroshima on May 27, 2016. Obama’s Visit to Hiroshima: Why Now? A presidential visit to Hiroshima had been contemplated for many years. Richard Nixon went in 1964 before taking office, and Jimmy Carter paid respects in 1984 after leaving office. Other presidents, including Gerald Ford, considered visiting while in office, but ultimately opted against doing so. Obama’s visit was the culmination of years of “testing the waters” for such a reconciliation event. U.S. Speaker of the House of Representatives Nancy Pelosi visited in 2008; Ambassador John Roos attended the August 6 memorial ceremony in 2010, as did current U.S. Ambassador to Japan Caroline Kennedy for the 2015 commemoration marking 70 years since the atomic bombing. Each of these officials apparently advised Obama to go, adding their voices to those of many American scholars and policymakers who have long encouraged a visit.19 Obama himself appeared interested in going to Hiroshima since his first trip to Japan as president in November 2009, when he said he would be “honored” to have the opportunity to visit the atomic bombed cities in the future.20 U.S. officials and Japanese counterparts quietly discussed the circumstances and timing of such a reconciliation event for some time. The opportunity was ultimately provided by Japan’s turn to host the Group of Seven (G7) Summit. Before the leaders meeting would be hosted in Ise-shima, Mie Prefecture, the foreign ministers meeting was held in relatively nearby Hiroshima. Secretary of State John Kerry’s visit to the Hiroshima Peace Memorial and Museum in April 2016 intensified media speculation on whether Obama would go, and effectively paved the way for Obama’s trip a month later.21 At the foreign ministers meeting, the G7 countries reaffirmed their commitment to pursuing a world without nuclear weapons in a way that promotes international stability.22 Kerry emphasized that it was “critical” to apply historical lessons from Hiroshima.23 Obama knew that the subsequent G7 Summit would be his last opportunity to visit Japan while in office and make a Hiroshima visit part of his legacy. The U.S. and Japanese bureaucracies quietly managed political sensitivities in planning the visit. The Abe government had already shown itself to be a strong U.S. ally: upgrading bilateral defense guidelines, making unprecedented steps toward collective self-defense, and increasing security cooperation in and beyond Asia. In April 2015, Abe visited the World War II Memorial in Washington, DC and addressed a joint meeting of the U.S. House of Representatives and Senate to express remorse about Japan’s wartime past and outline a broad vision for future U.S.-Japan cooperation.24 At the time, policymakers in Washington were concerned about the lack of historical reconciliation between Japan and South Korea as an obstacle to trilateral security cooperation.25 Consequently, the 12.28 “comfort women” agreement and subsequent improvements in relations between Tokyo and Seoul also increased the chances of Obama’s visit to Hiroshima. U.S. officials were confident that Obama’s visit would not be seen as rewarding any revisionist politician, but rather as a symbol of strength and reconciliation in U.S.-Japan relations. Central to this assessment were domestic political considerations in Japan and the United States. Past U.S. administrations considered a Hiroshima visit risky given the lack of consensus in Japan and the United States about the atomic bombings. While many Japanese saw the attacks as atrocities, others considered them punishment for Japan’s hostile acts, such as conquering Asia and the surprise attack on Pearl Harbor. During the Cold War, some Japanese nationalists asserted that the atomic bombs “evened out” Japan’s wartime atrocities, while far-left groups used World War II history to portray communism as a force for peace and the Americans as warmongering imperialists.29 As recently as 2009, some Japanese politicians worried that a presidential visit to Hiroshima would encourage anti-nuclear power plant and even anti-security alliance activists.30 However, the politics changed after the 2010 nuclear disaster at Fukushima and with the assertiveness of a rising China, particularly in the East and South China Seas. American public opinion on the bombing of Hiroshima had also evolved. Views of Japan as an enemy had all but disappeared, while a younger generation of Americans had come to believe that dropping the atomic bomb was morally wrong or militarily unnecessary.35 U.S. veterans groups opposing gestures of apology toward Japan are not as numerous as in the 1990s, while the largest veterans organizations were neutral or cautiously supportive of Obama’s visit.36 Nearing the end of his presidency, Obama could take responsibility for his visit to Hiroshima with little to no negative political implications for his preferred successor, Hillary Clinton. The timing was fortuitous for a Hiroshima visit to support U.S.-Japan reconciliation and the legacy of Obama’s nuclear policies without being prevented by domestic politics. 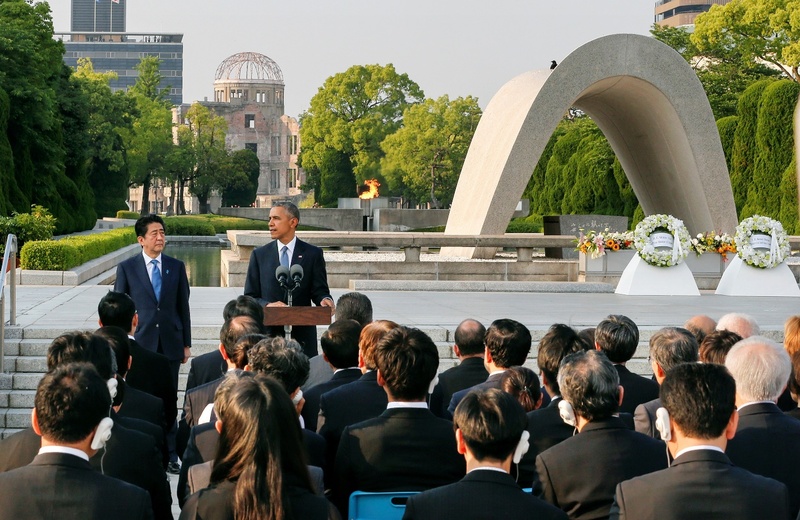 In the event, Abe accompanied Obama in laying wreaths and offering remarks at the A-bomb memorial. Foreign Minister Fumio Kishida, whose hometown is Hiroshima, guided the two leaders through the peace museum where they signed the guestbook expressing hopes for a world free from nuclear weapons. Obama symbolically offered folded paper cranes at the memorial museum and had brief, unscripted chats with several A-bomb survivors. One hibakusha embraced the president, not in a show of forgiveness upon receiving an apology, but in remembrance and a shared sense of future purpose. 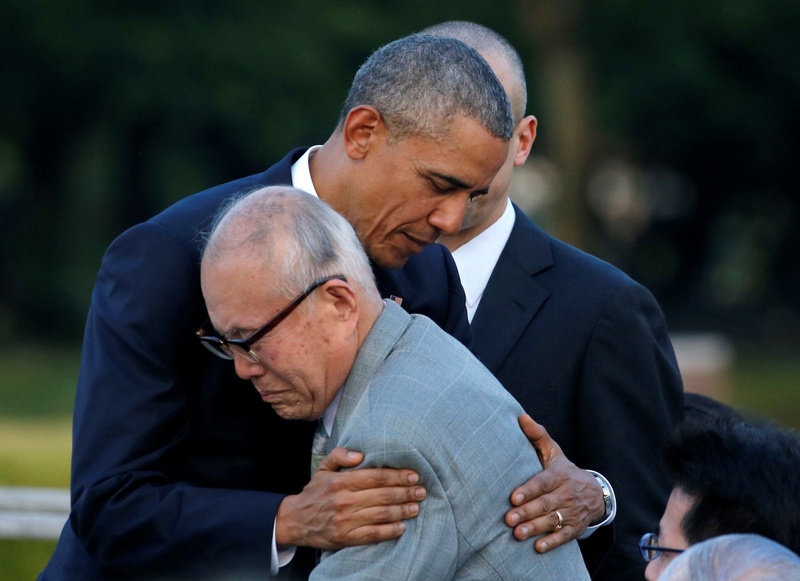 Obama embraces atomic bomb survivor Shigeaki Mori at the Hiroshima Peace Memorial Park, May 27, 2016. Carlos Barri ⓒ REUTERS. Obama’s remarks prompted debate over whether his visit to Hiroshima was appropriate for advancing historical reconciliation, U.S. diplomacy in Asia, and the nuclear nonproliferation agenda. Despite Obama’s articulation of the evils of war and of a sentiment that such horrible losses should not reoccur, he did not offer a repudiation of U.S. policy or an historical apology. Given very different historical conduct and present circumstances between U.S. and German cases, Obama had no intention of pursuing what is perceived in Asia as the “gold standard” of apologies. Germany is praised in Asia for successfully rehabilitating its international reputation after World War II by reconciling with victims of the Nazis. Not only did the Germans apologize and pay compensation, they adjusted their national history textbooks and regional diplomatic profile in consideration of victims. Symbolism was important in this process. In 1970, German Chancellor Willy Brandt fell to his knees before a monument to the victims of the Warsaw ghetto uprising.39 The gesture became an iconic example of German contrition and featured in neighboring countries’ media, museums and textbooks. 40 German leaders now routinely appear side-by-side with their European counterparts at joint war memorial events. This is not to say the process of reconciliation in Europe was easy or is even complete, but such efforts have contributed to the relative peace and prosperity Germany and its neighbors have enjoyed since World War II. After Obama’s Hiroshima visit, expectations will likely grow that Abe visit Pearl Harbor before he leaves office.42 December 7, 2016 will mark 75 years since the attack; Abe could possibly visit earlier during his travel in the Western Hemisphere for the November 2016 APEC Summit. A Japanese prime minister visiting Pearl Harbor would help demonstrate to the world that Japan is committed to promoting peace and reinforcing the U.S.-Japan alliance, setting a positive example for East Asia in terms of historical reconciliation and regional security.43 Unfortunately, Abe may consider such a visit unnecessary or even excessive since he already visited the World War II Memorial in Washington, DC. Japan’s first lady, Akie Abe offered flowers at the USS Arizona Memorial while on personal travel to Hawaii in August 2016, but it is unclear whether her gesture was a substitute or trial balloon for a visit by the prime minister. Various issues in U.S.-Japan relations require leadership attention and working-level efforts. Abe has personally engaged President Vladimir Putin regarding Japan’s lingering territorial disputes with Russia, while other members of the G7 are focused on the crises in Syria and Ukraine.46 Meanwhile, American frustrations have mounted over extreme delays in implementing the U.S.-Japan agreement for relocating the Futenma base and redeploying thousands of marines from Okinawa.47 Plans have been stalled by anti-base protests in Okinawa, fueled in part by criminal incidents involving U.S. military personnel in Japan.48 Obama and Abe held a joint press conference before the May 2016 G7 summit to address a recent murder incident on Okinawa. While the crime inflamed debate in Japan over the status of U.S. forces in the country, the manner in which leaders coordinated responses on a sensitive issue further attested to the strength of U.S.-Japan relations. Both Hiroshima and Okinawa have long been the focus of political opposition groups in Japan, and hence points of potential friction between Washington and Tokyo. One implication of Obama’s Hiroshima visit for the relationship is that American policymakers have internalized the importance of not only getting along with pro-alliance conservatives in Japan, but also with progressive civil society as well. Abe will not always be prime minister, and when progressives feel vindicated and recognized, they may become more supportive of Japan’s international contributions and do more for reconciliation, such as supporting Japan’s apologies to Asian neighbors. The event in Hiroshima demonstrates how far U.S.-Japan relations have come since World War II and how Washington and Tokyo seek to strengthen international norms for protecting civilian populations.56 This is a mainstream message that should reassure Japanese pacifists and Japan’s neighbors about the role of the U.S.-Japan alliance. It is also a call to action as reconciliation can open the door to increased security cooperation. There are serious terrorist threats that are the antithesis of the international norms held up at Hiroshima, and there are states—North Korea chief among them—that actively disregard these norms. The question going forward is not whether Obama was right or wrong to visit Hiroshima, but rather how his successor will pick up and lead the nonproliferation agenda, and whether U.S.-Japan reconciliation can encourage a virtuous cycle whereby Japan makes progress overcoming historical disputes with its neighbors in Asia. The history surrounding the decision to drop the bomb is immensely complex. There is no consensus among historians about motivations, process, counterfactuals or ethical considerations.57 Many critics worried that no matter how the Obama administration framed the visit, it would be seen as an apology for the atomic bombings, affirming a Japanese “victim narrative.” Concerns in China and South Korea included the idea that Tokyo prioritizes its relations with Washington, and upon receiving vindication from the Americans, Japanese would look down on neighboring countries. 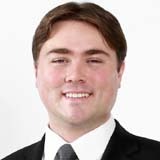 Japanese conservatives could use reconciliation with the U.S. as evidence of Japan’s righteousness, and then make the argument that tensions in Asia are a function of North Korean provocations, South Korean recalcitrance, and Chinese nationalism, lack of democracy, and territorial expansionism. However, the U.S. has not reduced cooperation with South Korea or engagement with China. It is difficult to draw any connection between Obama’s visit and even tacit American support for Japanese historical revisionism. A close inspection of the political statements and choreography in Hiroshima on May 27, 2016, as well as subsequent government and media responses in the U.S. and Japan, suggest that the most pessimistic predictions for regional dynamics have not materialized. There is evidence that the visit politically helped Abe, who holds views and pursues policies that are controversial in the region.60 According to an aggregation of Japanese media polls, public opinion of the Abe Cabinet improved from 43% approval / 33% disapproval before the G7 Summit and Hiroshima event to 51% approval / 33% disapproval afterwards.61 It appears that those opposed to the Abe Cabinet were unmoved by the international summit and reconciliation event, but many respondents who held a neutral view or expressed no opinion on Abe’s leadership were persuaded to give him a 8-point boost in the polls. Such improvement was no doubt welcomed by the LDP and may have helped the ruling coalition prevail in Upper House elections in July 2016. But the electoral success of the coalition had more to do with the disorganized opposition’s inability to present a credible economic alternative to Abenomics, rather than recent developments on history issues or inter-party differences on foreign policy. Nonetheless, the Japanese political landscape after the Upper House elections will be a source of concern for Chinese and South Korean observers in at least two respects. First, Abe reshuffled his cabinet to reinvigorate his policy team and also to shape the LDP and national leaderships to come after his premiership. His elevation of politicians with conservative historical views like Tomomi Inada, the new defense minister, could lead to a flare up of issues such as the Yasukuni Shrine, history textbooks, and disputed islands. Second, even though revising Japan’s constitution—yet to be amended in the postwar period—remains procedurally and politically difficult, the Upper House elections yielded a two-thirds majority in parliament for politicians favoring constitutional reform. Political debate on whether to revise the pacifist Article 9 of the constitution can thus be expected before Japan’s next national election in 2018. In the meantime, the U.S.-Japan reconciliation event at Hiroshima may challenge the version of history implicit in Beijing’s regional diplomacy. Chinese commemorations in 2015, marking 70 years since the end of World War II, painted Japan as the threat to global peace that China “defeated” on behalf of the world in 1945. Speeches and comments by Chinese officials suggested that a previously victimized, now militarily and economically powerful China is willing and able to stand up to contemporary Japan’s revisionist tendencies.62 Beijing attempted to form an alliance with South Korea on history issues,63 but such attempts at teaming up against Tokyo were rejected by Seoul.64 Instead, South Korea reinitiated the Korea-Japan-China trilateral summit mechanism.65 Moreover, the July 2016 South Korean decision to deploy the Terminal High Altitude Area Defense (THAAD) missile defense system in cooperation with the U.S. and against vociferous protests from Beijing demonstrates Seoul’s prioritization of the North Korean threat over regional politics concerning history. Since Japan and South Korea have only recently reached a compromise on reconciliation for surviving “comfort women,” the agreement remains fragile, and several other historical memory issues remain unresolved. The image of an American president in Hiroshima, grappling with the horrible consequences of war, could encourage future gestures on the part of Japan. Obama’s visit may thus give the U.S. some “soft power” leverage for encouraging Japan to reconcile further with South Korea. Given Abe’s personal views and how South Korean and Chinese public opinion are largely set against him,72 it is unlikely a Japanese prime minister will make an apology tour of war-related monuments in neighboring countries any time soon. However, it would be beneficial for Japanese foreign policy if current cabinet members abstain from visiting Yasukuni Shrine, and beneficial to the U.S.-Japan alliance and East Asian regional integration if the next Japanese prime minister cultivated a reputation for promoting historical reconciliation in Asia. In the medium to long-term, Obama’s visit will likely be seen less as a political victory for Abe than a victory for the city of Hiroshima and the survivors of the atomic bombings. To be sure, many observers of Obama’s visit will see what they wish to see in it, but the president and his advisers made very clear that the trip was not about re-adjudicating the past or making an apology. The message was that nuclear weapons can take a horrible human toll, necessitating further policy efforts on nonproliferation and disarmament. The visit to Hiroshima therefore bookends Obama’s time in office with a nuclear nonproliferation and disarmament narrative. The administration achieved progress in these functional areas via the series of Nuclear Security Summits (NSS), where relevant states and international organizations coordinated policies to secure fissile and radiological materials, protect sensitive information, and improve the interface between safety and security at nuclear facilities.74 The NSS process helped remove bomb-grade nuclear fuel from Ukraine and elsewhere, and reduced vulnerabilities to terrorist attack. Progress was also made with Japan’s post-Fukushima nuclear power safety measures against natural disasters,75 and U.S.-South Korean civilian nuclear energy cooperation under a renewed “123 agreement” including research on nuclear disposal in a proliferation resistant manner.76 The 2015 P5+1 deal with Iran limits Tehran’s ability to make a nuclear weapon by having it give up portions of its nuclear material and placing its program under greater international surveillance. The 2010 New START agreement with Russia reduced the number of U.S. and Russian strategic warheads, representing incremental progress on nuclear disarmament. North Korea is currently the only state detonating nuclear devices, conducting its fourth nuclear test on January 6, and fifth on September 9, 2016. Pyongyang’s nuclear cooperation with the Syrian regime and ballistic missile cooperation with Iran demonstrate that it cannot be trusted to simply develop its own deterrent without proliferating technologies to other states and even non-state actors.82 North Korea has recently conducted numerous and varied missile tests, with some landing provocatively close to Japan, while engaging in bellicose rhetoric including threatening nuclear attacks on South Korean and American cities. The U.S., South Korea and Japan have increased trilateral cooperation in response, but policymakers in Seoul are concerned that in retaliation to THAAD deployment, Beijing might obstruct additional UN resolutions or loosen implementation of UNSCR 2270 sanctions. South Koreans also worry that China may expand diplomatic engagement with Pyongyang, effectively increasing toleration of North Korea’s nuclear weapons program. Some of these suggestions may eventually make good policy, but not as orders by a president just before he leaves the White House. There has not yet been sufficient consultation with Congress and U.S. allies, and rushed unilateral moves would secure little to nothing in return from other nuclear actors. Eleventh-hour declarations may not endure after a change in government, and would almost certainly produce unintended consequences for the credibility of U.S. nuclear doctrine and the deterrence and assurance functions of the U.S. strategic arsenal. While some in the disarmament community are disappointed with Obama’s nuclear legacy, the United States should continue to refuse risking defense of the homeland or undermining extended deterrence for American allies in pursuit of global “nuclear zero.”96 Rather than criticize the U.S. maintenance of its nuclear arsenal or the allies under the American nuclear umbrella, the disarmament community’s collective pressure would be better applied toward encouraging Russia to comply with existing agreements, China to strengthen its status quo credentials, and North Korea to denuclearize. Obama’s successor will need to continue the balancing act of working with allies on mutual defense and extended deterrence on the one hand, and pursuing nonproliferation efforts with a commitment to nuclear disarmament on the other.97 By maintaining alliance commitments while also expressing aspirations for a nuclear-free world, Obama not only made efforts for his own legacy, he sought to make the deterrence-nonproliferation balancing act more manageable for the next U.S. president. President Obama’s visit to Hiroshima was a successful reconciliation event. The visit did not feature an American apology or focus on Japanese victimhood, but achieved the purposes outlined by U.S. and Japanese officials: humbly recalling the horrors of war and aspiring to a world without nuclear weapons. Obama’s speech explicitly recognized the suffering of Korean victims, and Abe’s remarks suggested that Japan’s commitment to pacifism is enduring. With a meaningful display of how far U.S.-Japan cooperation has come since 1945, relations were somewhat fortified from the uncertainty of the U.S. presidential election. Obama’s visit to Hiroshima will largely have a symbolic effect on global nonproliferation and disarmament agendas. The visit is unlikely to pressure Russia to do more on disarmament, encourage China to increase transparency of its strategic forces, expand international support for the Iran nuclear deal, or provide any added leverage over North Korea. However, the visit could offer some legacy effects for U.S. policy. The next occupant of the White House will face enduring challenges in maintaining deterrence and advancing nonproliferation, but will also find it difficult to make a hard turn away from Obama’s policy of reducing the role of nuclear weapons in U.S. foreign policy. The trajectories of national security policies are difficult to change, but high-level visits to a war memorial site can raise global awareness, and poignant speeches can resonate for years to come.100 Images and words from Obama’s Hiroshima visit are likely to appear in museums and history textbooks in the Asia-Pacific, helping the next generation in the region move past the horrible suffering of World War II. In the meantime, it would behoove leaders in Washington and Tokyo to remind each other that the urgent policy priority is working with allies in South Korea and Europe to defend the nonproliferation regime from challenges posed by Russia and China, and especially from the threat of North Korea’s nuclear and missile programs. The author appreciates constructive feedback from Kang Choi, Jonathan Chow, Daniel Ghirard, Duyeon Kim, Jinwoo Kim, Adam Liff, Gilbert Rozman, Scott Snyder, and Kazuhiko Togo, and thanks Kristie Youngeun Kang of Ewha Womans University for excellent research assistance. For discussion, see Robert Kelly, “The Huge, Strange Coalition Opposed to an Obama Apology at Hiroshima,” Lowy Interpreter, May 4, 2016. Michael J. Hogan, Hiroshima in History and Memory. New York: Cambridge University Press, 1996. Neil A. Lewis, “Smithsonian Substantially Alters Enola Gay Exhibit after Criticism,” New York Times, October 1, 1994. Julian Ryall, “U.S. Veterans Wary of Obama’s Upcoming Hiroshima Visit,” Deutsche Welle, May 12, 2016. “Rebuilding Bridges: As the G7 Gathers in Japan, Religion, Politics and the Bomb Will All Help Shinzo Abe,” Economist, May 21, 2016. “China says Nanjing more worthy of remembrance than Hiroshima,” Agence France Presse, May 29, 2016; “China calls for sincere apology after Abe’s statement,” Xinhua, August 15, 2015. Amy King, “China’s Response to Japan’s Constitutional Reinterpretation,” East Asia Forum, July 27, 2014. Yinan He, “History, Chinese Nationalism and the Emerging Sino-Japanese Conflict, Journal of Contemporary China, Vol. 16, No. 50 (February 2007), pp. 1-24. Maki Kimura, Unfolding the ‘Comfort Women’ Debates: Modernity, Violence, Women’s Voices. New York: Palgrave, 2016. This was a common sentiment expressed by Korean colleagues in conversations with the author in Seoul, May 2016. 이원덕 (Won-deog Lee), “한일 과거사 갈등의 구조와 해법 모색” (“The Structure of the ‘History Disputes’ between Korea and Japan and a Search for a Solution”), 世界地域硏究論叢 (Korean Journal of Area Studies), Vol. 23, No. 2 (September 2005), pp. 197-220; Hans Spross, “Japan’s Difficult Reconciliation with Its past,” Deutsche Welle, August 8, 2015. Sarah Kim, “‘Comfort Women’ Foundation Chief Is Attacked,” JoongAng Daily, July 29, 2016. Estimates vary, see for example, 허광무 (Kwang-moo Hur), “한국인 원폭피해자에 대한 재 연구와 문제점” (“Review and Prospect of Studies on Korean A-bomb Victims”), 한일민족문제학회 (Journal of Korean-Japanese National Studies), Vol. 6 (2004), pp. 93-122; Andreas Hippin, “The End of Silence: Korea’s Hiroshima,” Japan Times, August 2, 2005. “We Will Keep an Eye on President Obama’s First Visit to Hiroshima,” Dong-A Ilbo, May 12, 2016. Dong-ik Shin, “Humanitarian Impact of Nuclear Weapons and the Issue of U.S. President Obama’s Hiroshima Visit,” IFANS Focus, April 25, 2016. “South Korean Hibakusha Urge Obama to Apologize in Hiroshima,” Japan Times, May 20, 2016. Paul Piller, “President Obama Should Visit Hiroshima,” National Interest, April 13, 2016. “Obama’s Visit to Hiroshima,” Japan Times, May 11, 2016. Yuki Tatsumi, “What to Expect from Obama’s Hiroshima Visit,” Diplomat, May 11, 2016. “G7 Hiroshima Declaration Calls for ‘World without Nuclear Weapons,’” Agence France Presse, April 11, 2016. John Kerry, Press Availability for G7, International Media Center, Hiroshima, Japan, April 11, 2016; http://www.state.gov/secretary/remarks/2016/04/255689.htm. Shinzo Abe, “Toward an Alliance of Hope,” Address to a Joint Meeting of the U.S. Congress, April 29, 2015; http://japan.kantei.go.jp/97_abe/statement/201504/uscongress.html. Leif-Eric Easley, “Korean Courage to Deal with Japan,” American Foreign Policy Interests, Vol. 36, No. 1 (February 2014), pp. 25-33; http://www.tandfonline.com/doi/abs/10.1080/10803920.2014.879516. Homepage of the Japan Confederation of A- and H-Bomb Sufferers Organizations; http://www.ne.jp/asahi/hidankyo/nihon/rn_page/english/introduction.html. “Hibakusha Praise Obama Hiroshima Visit, but Fear History Will Go Unquestioned,” Mainichi Shimbun, May 14, 2016. Shohei Okada, “Hibaksusha in Nagasaki Hail Obama’s Plan to Visit Hiroshima,” Asahi Shimbun, May 12, 2016. On the often overlooked experience of Nagasaki, see “Japan and the Bomb: When the Cloud Parted,” Economist, August 1, 2015. Ian Buruma, quoted in “Obama’s Hiroshima Trip Rekindles Decades-Old Controversies,” Asahi Shimbun, May 14, 2016. Abigain Leonard, “Hiroshima Survivors Want Obama to Apologize, but the Japanese Government Probably Doesn’t,” Voxworld, May 27, 2016. According to a Kyodo survey after the event, an overwhelming 98% of the Japanese public supported Obama’s visit to Hiroshima; “Cabinet’s Support Rating Jumps to 55.3% but Obama Speech Wows 98%: Survey,” Japan Times, May 29, 2016. Carol E. Lee and Peter Landers, “President Obama to Visit Hiroshima Later This Month,” Wall Street Journal, May 10, 2016. “Hibakusha Want to Meet Obama, Hear Apology in Hiroshima,” Asahi Shimbun, May 20, 2016. Jennifer Lind, “The Presidential Path to Hiroshima,” Foreign Affairs, April 8, 2016. Bruce Stokes, “70 years after Hiroshima, Opinions Have Shifted on Use of Atomic Bomb,” Pew Research Center, August 4, 2015; http://www.pewresearch.org/fact-tank/2015/08/04/70-years-after-hiroshima-opinions-have-shifted-on-use-of-atomic-bomb. For comments from the American Legion, Veterans of Foreign Wars, and Disabled American Veterans, see Gregg Zoroya, “Veterans see Obama’s visit to Hiroshima as ‘bittersweet,’” USA Today, May 27, 2016. “Barack Obama to Visit Hiroshima on Japan and Vietnam Trip,” BBC News, May 10, 2016. Remarks by President Obama and Prime Minister Abe of Japan at the Hiroshima Peace Memorial, May 27, 2016; http://www.whitehouse.gov/the-press-office/2016/05/27/remarks-president-obama-and-prime-minister-abe-japan-hiroshima-peace. “Many Praise Germany, Scorn Japan 70 Years after WWII,” Japan Times, August 13, 2015. Tessa Morris-Suzuki, The Past Within Us: Media, Memory, History. London: Verso, 2005. Peter Ennis, “Prime Minister Kan and Arlington National Cemetery,” Dispatch Japan, June 5, 2010; “Second Day of the Prime Minister’s Visit to the United States,” Kantei (Office of the Japanese Prime Minister), May 1, 2012; http://japan.kantei.go.jp/noda/actions/201205/01usa_e.html. Zach Przystup, “Abe Should Visit Pearl Harbor,” Foreign Affairs, May 10, 2016. 松尾 文夫 [Fumio Matsuo], オバマ大統領がヒロシマに献花する日 [The Day President Obama Offers Flowers at Hiroshima], 小学館101新書 [Shogakukan 101 Shinsho], 2009. Remarks by President Obama and Prime Minister Abe of Japan at Hiroshima Peace Memorial, May 27, 2016; http://www.whitehouse.gov/the-press-office/2016/05/27/remarks-president-obama-and-prime-minister-abe-japan-hiroshima-peace. Ryo Sahashi and James Gannon, eds. Looking for Leadership: The Dilemma of Political Leadership in Japan. Tokyo: JCIE, 2015. Jeffery W. Hornung, “Why Has Japan Been Cozying up to Vladimir Putin?” Newsweek, May 25, 2016. Emma Chanlett-Avery and Ian E. Rinehart, “The U.S. Military Presence in Okinawa and the Futenma Base Controversy,” Congressional Research Service Report, No. R42645, January, 2016; https://www.fas.org/sgp/crs/natsec/R42645.pdf. Yuki Tatsumi, “U.S. military personnel arrested in Okinawa, again,” Diplomat, May 23, 2016. Peter Tasker, “Why Obama’s Historic Hiroshima Visit Is a Mistake,” Nikkei Asian Review, May 18, 2016. Van Jackson, “Raindrops Keep Falling on My Nuclear Umbrella,” Foreign Policy, May 18, 2015. Adam P. Liff, “Japan’s Defense Policy: Abe the Evolutionary,” Washington Quarterly, Vol. 38, No. 2 (Summer 2015), pp. 79-99. Justin McCurry, “New Generation of Japanese Anti-War Protesters Challenge Abe,” Guardian, September 16, 2015. Leif-Eric Easley, “How Proactive? How Pacifist? Charting Japan’s Evolving Defense Posture,” Australian Journal of International Affairs, (July 2016); http://www.tandfonline.com/doi/10.1080/10357718.2016.1181148. Shinzo Abe, Address by Prime Minister at the Memorial Ceremony to Commemorate the Fallen on the 71st Anniversary of the End of the Battle of Okinawa, June 23, 2016, http://japan.kantei.go.jp/97_abe/statement/201606/1217954_11009.html. Obama, Hiroshima, May 27, 2016. While international relations scholars speak of a “taboo” on the use of nuclear weapons against cities, this norm is not as strong as it could be. Truman’s decision to use the bomb against Japan is less popular today than after World War II, but recent survey research suggests there is willingness among the American public to respond to a hypothetical “21st century Pearl Harbor” attack by Iran with a nuclear strike on an Iranian city entailing casualties similar to Hiroshima. Scott D. Sagan and Benjamin A. Valentino, “Would the U.S. Drop the Bomb Again?” Wall Street Journal, May 19, 2016. Kenneth B. Pyle, “Hiroshima and Historians: History as Relative Truth,” Asia-Pacific Review, Vol. 22, No. 2 (January 2016), pp. 14-27. Ken Moriyasu, “Japan and China’s Differing View of Obama’s Hiroshima Visit,” Nikkei Asian Review, May 27, 2016. Dong-joon Jo, “Divisive Messages from President Obama’s Visit to Hiroshima,” EAI Issue Briefing, June 9, 2016, p. 3. On how Abe used the G7 Summit and Hiroshima visit to promote his domestic political agenda, see Akihiko Tanaka, “A View from Japan,” Asan Forum, June 16, 2016. Tobias Harris, “Abe Support Jumps in Wake of G7 summit, Obama’s Hiroshima Visit,” Japan Political Pulse, June 2, 2016. “Parade’s End: The Real Purpose of a Rare Military Display Was to Show Who Is in Charge,” Economist, September 5, 2015. Jae-ho Chung and Jiyoon Kim, “Is South Korea in China’s Orbit? Assessing Seoul’s Perceptions and Policies,” Asia Policy, No. 21, January 2016. Cheol-hee Park, “Reviving the U.S.-Japan-Korea Triangle in South Korean Diplomacy,” Asan Forum, April 29, 2016. Sarah Teo, “What Does the China-Japan-South Korea Trilateral Summit Mean for East Asia?” East Asia Forum, November 27, 2015. Mira Rapp-Hooper, “Parting the South China Sea,” Foreign Affairs, July 2016. Jonathan T. Chow and Leif-Eric Easley, “Upgrading Myanmar-China Relations to International Standards,” Asan Issue Brief, Vol. 4, No. 21 (December 2015), pp. 1-24; http://en.asaninst.org/contents/upgrading-myanmar-china-relations-to-international-standards. The annual Korea-Japan-China summit is due to be held in late 2016, but scheduling of the trilateral summit has been delayed in the past owing to historical and territorial issues in Northeast Asian regional politics. The summit will thus offer a barometer on how much pressure Beijing looks to apply on history issues. Yong-in Yi and Yun-hyung Gil, “South Korea Left Sitting on the Sidelines during Obama’s Visit to Hiroshima,” Hankyoreh, May 28, 2016. Akira Nakano, “Obama Visit Progress but Not Enough, Korean Hibakusha Say,” Asahi Shimbun, May 28, 2016; Akira Nakano, “Korean A-Bomb Survivors to Demand U.S. Apology,” Asahi Shimbun, August 5, 2016. “‘It Is Meaningful for Obama to Mention Korean Atomic Bomb Victims,’ Says Seoul,” Korea Times, May 28, 2016. For updated polls, see the Asan Public Opinion Studies Program at http://en.asaninst.org/contents/centers/public-opinion-studies-center, and the Mansfield Asian Opinion Poll Database at http://mansfieldfdn.org/program/research-education-and-communication/asian-opinion-poll-database. Barack Obama, Remarks in Hradcany Square, Prague, Czech Republic, April 5, 2009; https://www.whitehouse.gov/the-press-office/remarks-president-barack-obama-prague-delivered. “Nuclear Security Summits History,” 2016 Nuclear Security Summit website, http://www.nss2016.org/about-nss/history. “What Are the Lessons Learned from Fukushima?” U.S. Nuclear Regulatory Commission website; http://www.nrc.gov/reactors/operating/ops-experience/japan-dashboard/priorities.html. Duyeon Kim, “Decoding the U.S.-South Korea Civil Nuclear Cooperation Agreement,” CSIS, September 30, 2015; https://www.csis.org/analysis/decoding-us-south-korea-civil-nuclear-cooperation-agreement; Paul K. Kerr and Mary Beth D. Nikitin, “Nuclear Cooperation with Other Countries,” Congressional Research Service Report, No. RS22937, December 2015; http://fas.org/sgp/crs/nuke/RS22937.pdf. Barack Obama, “How We Can Make Our Vision of a World Without Nuclear Weapons a Reality,” Washington Post, March 30, 2016. Ankit Panda, “Pakistan Clarifies Conditions for Tactical Nuclear Weapon Use against India,” Diplomat, October 20, 2015; Paul K. Kerr and Mary Beth Nikitin, “Pakistan’s Nuclear Weapons,” Congressional Research Service Report, No. RL34248, August 2016; https://www.fas.org/sgp/crs/nuke/RL34248.pdf. Suhasini Haidar, “NSG Plenary Ends without Movement in India’s Application,” The Hindu, June 24, 2016. Daniel Poneman, “Forging a New Consensus to Fight Climate Change and Weapons Proliferation,” Belfer Center, August 4, 2016. G7 Ise-Shima Leaders Declaration, May 27, 2016; http://www.mofa.go.jp/files/000160266.pdf. Paul Kerr, Steven Hildreth and Mary Beth Nikitin, “Iran-North Korea-Syria Ballistic Missile and Nuclear Cooperation,” Congressional Research Service Report, No. R43480, February 2016; https://www.fas.org/sgp/crs/nuke/R43480.pdf. “U.N. Nuclear Disarmament Talks,” Japan Times, May 22, 2016; http://www.japantimes.co.jp/opinion/2016/05/22/editorials/u-n-nuclear-disarmament-talks; “Open-ended working group on nuclear disarmament,” Reaching Critical Will website, http://www.reachingcriticalwill.org/disarmament-fora/oewg. Richard Fontaine, “A Thaw in the U.S.-New Zealand Nuclear Freeze,” Diplomat, July 27, 2016. Barack Obama, “Remarks by the President at the Acceptance of the Nobel Peace Prize,” Oslo City Hall, Norway, December 10, 2009; https://www.whitehouse.gov/the-press-office/remarks-president-acceptance-nobel-peace-prize. Nuclear Posture Review Report, Department of Defense, 2010; http://www.defense.gov/Portals/1/features/defenseReviews/NPR/2010_Nuclear_Posture_Review_Report.pdf. Scott D. Sagan, “After Hiroshima,” Kyodo, May 26, 2016. For a prominent American argument for a world without nuclear weapons, see George P. Shultz, William J. Perry, Henry A. Kissinger and Sam Nunn, “Toward a Nuclear-Free World,” Wall Street Journal, January 15, 2008. James E. Doyle, “America Mustn’t Overspend on Its Nukes,” Arms Control Association, December 23, 2014. James Cartwright and Bruce Blair, “End the First-Use Policy for Nuclear Weapons,” New York Times, August 14, 2016. Editorial Board, “A Nuclear Legacy within Reach,” New York Times, August 7, 2016. Dianne Feinstein and Ellen Tauscher, “A Nuclear Weapon that America Doesn’t Need,” New York Times, June 17, 2016. Jonathan Pollack and Richard Bush, “Before Moving to ‘No First Use,’ Think about Northeast Asia,” Brookings, July 20, 2016; https://www.brookings.edu/2016/07/20/before-moving-to-no-first-use-think-about-northeast-asia. 183 states have signed the CTBT, but in order for the treaty to come into force, it must be signed and ratified by all Annex 2 countries. The U.S. was the first to sign and observes the treaty’s provisions, but the Senate has not yet ratified it. China, Egypt, Iran, and Israel have also yet to ratify, while North Korea, India, and Pakistan have not signed. “Adopting Resolution 2310, Security Council Calls for Early Entry into Force of Nuclear-Test-Ban Treaty, Ratification by Eight Annex 2 Hold-Out States,” United Nations, https://www.un.org/press/en/2016/sc12530.doc.htm. For example, when the American and South Korean presidents met on the margins of the September 2016 East Asian Summit in Laos, Obama expressed an unwavering U.S. commitment to extended deterrence, and Park emphasized coordinated plans for THAAD deployment. For recent analysis of this balancing act in the U.S.-South Korea case, see Robert Einhorn and Duyeon Kim, “Will South Korea Go Nuclear?” Bulletin of the Atomic Scientists, August 15, 2016; http://thebulletin.org/will-south-korea-go-nuclear9778. This is not to say instrumental uses of history will disappear. On the contrary, those who support reconciliation between South Korea and Japan should be watchful of state-backed local and academic groups in China looking to engage Korean NGOs on anti-Japanese historical research and efforts to petition UN bodies in a united front on history issues. A positive example was provided by President Park’s forward-looking remarks regarding Seoul-Tokyo ties in her recent Liberation Day speech; Geun-hye Park, Commemorative Address on the 71st Anniversary of Liberation, Seoul, Korea, August 15, 2016. A negative example was provided the same day by a group of lawmakers visiting Dokdo (an islet under South Korean control but claimed by Japan as Takeshima); Editorial Board, “Stop ‘Dokdo Populism,’” JoongAng Daily, August 15, 2016. Robin Wright, “What the Pope Saw at Hiroshima,” New Yorker, May 12, 2016.